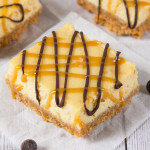 My Salted Caramel Cheesecake Bars marry velvety smooth cheesecake with the salty sweet gorgeousness that is Salted Caramel. 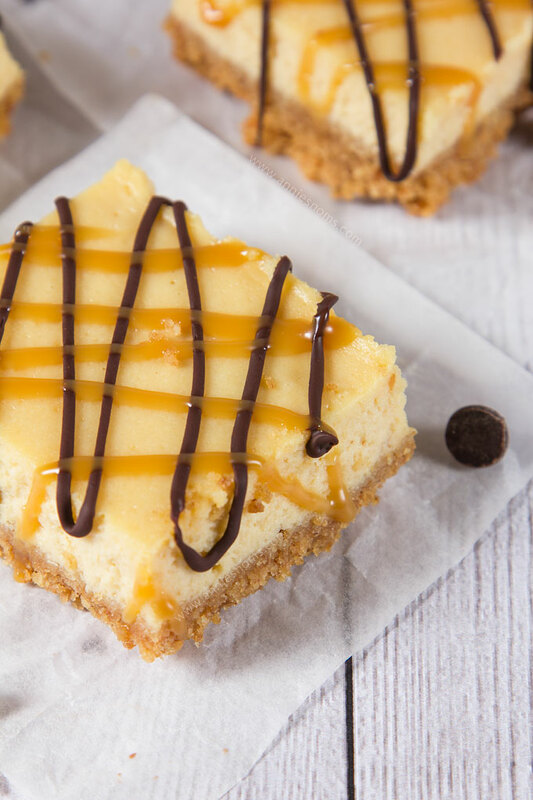 With caramel in the cheesecake and on top, these are a caramel lovers dream! So, we’ve finally decided on a year and a country for our wedding; Lapland in 2018. Basically, we’re doing what we want to do. We want to get married in Lapland because we want to see the Northern Lights and we’re waiting until 2018 because we won’t be able to afford it next year and I don’t like odd numbers, so 2017 is definitely out. Yeeeesh 17 is a horrible number. Another reason for Lapland is that when I was a kid I always dreamed of getting married in the snow with my bridesmaids in dark green. I find snow a bit magical and it will look so gorgeous in photos! I do struggle with the cold though… so maybe it’s not the best choice; I don’t want to go blue and be shivering in my wedding photos haha! Now, who wants velvety smooth cheesecake in portable form? When the whole salted caramel thing took off I really wasn’t sure if I’d like it. I have this weird thing with sweet and savoury. I’m kind of grossed out by it; jam on toast? No. Chocolate spread on toast? Definitely not. But, when I had my first mouthful of that sweet, rich, slightly salty sauce it was love at first… lick? 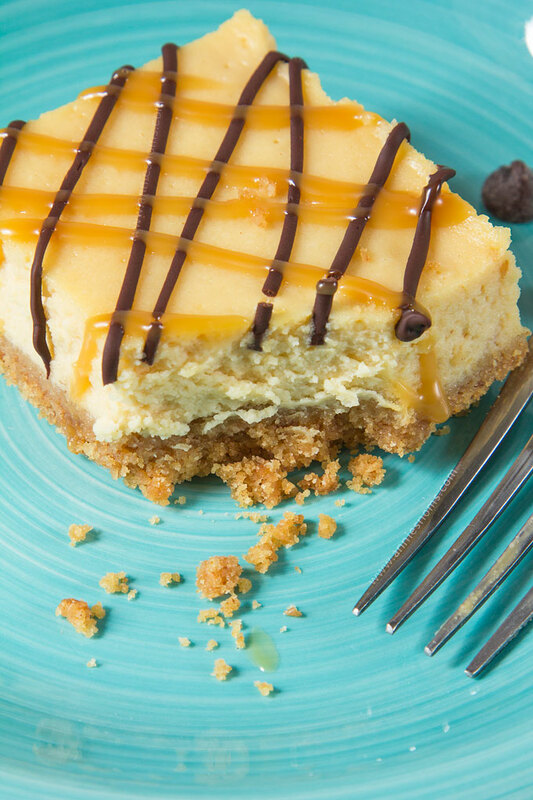 I thought it only natural to marry fluffy, smooth cheesecake with rich, sticky caramel. I put 1/3 cup of caramel into the cheesecake batter and baked it all up before drizzling more caramel on top with a little drizzle of dark chocolate to cut through the sweetness. I contemplated putting chocolate chips into the cheesecake too, but I wanted the salted caramel to be the star of the show! And it totally is. You get the tang of the cheese, a salty hit and then rich, sweet notes. All together it’s blissful. 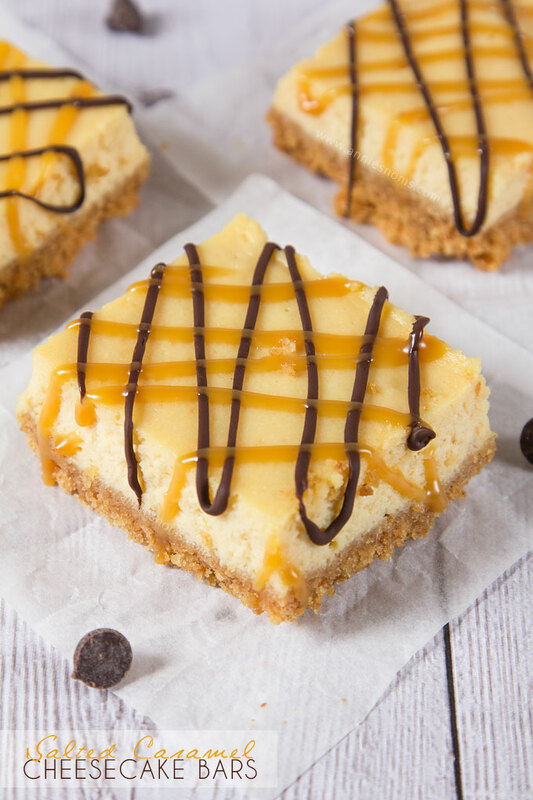 I stuck with a traditional digestive/graham cracker crust and they are the perfect biscuit for this cheesecake bar! Not too sweet, a little crumbly and a tiny bit caramelized. You need these bars in your life. They’re baked in 30 minutes then you just have to wait for them to cool before slicing, drizzling and devouring. Preheat oven to 180C/350F and grease and line an 8x8 inch square pan. Place crushed digestives into a medium sized bowl and then pour melted butter over them. Stir until all the crumbs are coated in butter and then tip into your lined pan. Press into the pan with the bottom of a cup/spatula/your hand until you have a level layer, pressed pretty firmly into the pan. Place in the oven for 10-12 minutes until firm to the touch and slightly crisp. Whilst the base is baking, make the cheesecake filling: Place cream cheese, vanilla extract, eggs, sugar and salt into a large bowl and beat with a hand mixer or by hand with a whisk until smooth, light and well combined with no lumps. Add in the caramel sauce and beat until well incorporated. Pour the cheesecake mixture over your baked base and smooth over with a spatula. Place in the oven for 20-25 minutes until golden around the edges, set in the middle with the slightest wobble and the whole cheesecake should be slightly yellow/golden. 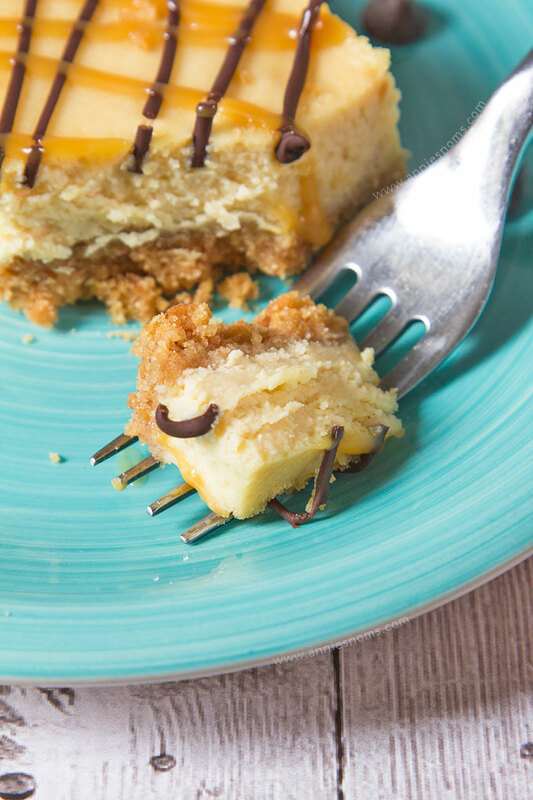 You can insert a small knife as well; it should cut cleanly with no cheesecake sticking to it. Leave to cool in the pan for at least an hour before transferring to a chopping board to slice into 9-12 bars. Place cut bars onto a wire rack with kitchen paper underneath (to catch drips) Place dark chocolate into a small heatproof bowl and place in the microwave in 20 second increments, stirring in between, until melted and smooth. Transfer to a small Ziploc bag/piping bag and snip a tiny bit off of one corner. Drizzle melted chocolate diagonally across all bars. Place salted caramel into a small heat proof bowl and microwave for 20 seconds. Place into a small Ziploc/piping bag and snip a tiny bit off of one corner; drizzle the opposite way to the melted chocolate, across all bars. 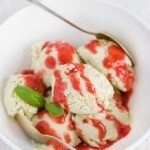 Leave to set before storing in an airtight container, in the fridge, for 3 days. You’re right…I NEED these bars in my life!! 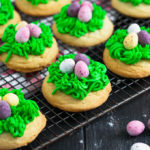 🙂 They look absolutely delicious! Pinned! These bars look delicious! I love cheesecake. Being able to see the Northern Lights when you get married sounds awesome. 17 is my favorite number lol. 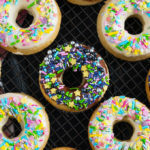 Well, maybe the diet can start tomorrow… these look so amazing!! Definitely bookmarking this recipe to try later. Haha I tell myself that every day!! There’s just too many delicious things to be made though! 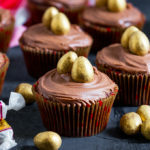 Wow, these look fabulous!! Pinned to make soon! Also love the thought of dark green bridesmaids dresses! Thanks so much Meg! It’s been a dream of mine since I was a kid, can’t wait to see them in reality; just hope they are as gorgeous as they are in my mind!! Oh my gosh…. no will power left… your photos are killing me! 😉 Such a cheesecake addict! That’ll be a beautiful wedding place!! I’d love to see the Northern Lights. AND I want these bars too! These sound sooooo good! And i think your wedding plans sound fabulous! I won’t argue with you! I need these luscious bars in my life! I really hope so!! Cheesecake on stand-by; you’re well prepared! 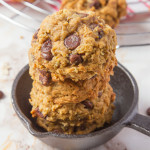 yum, wish I could make them right now. Amazingly delicious! Thanks for linking up with What’s Cookin’ Wednesday! This looks insane! Salted caramel is one of those flavors I just discovered a few years ago and totally fell in love with. This looks like it’s right up my alley. Weddings and family drama seem to go together. Just do what you want to do and ignore them. As a Colorado bride who got married in January and insistence on outdoor photos, I strongly recommend you purchase or rent some (fake) fur coats for you and the bridesmaids. (Think Narnia.) They look amazing in our snowy photos and none of us turned blue. We did take them off for a couple shots to get great views of the dresses, but the rest of the shots look very elegant and fun with the coats. As for the cheesecake bars, I was on the fence until I saw the gif and then it was like an immediate need took over. These are totally on my shopping list this week! Totally agree, more drama than it’s worth!! I love the idea of having some fake fur coats with the snow in the background, that sounds so magical, definitely going to look into it, thank you! These look so good! 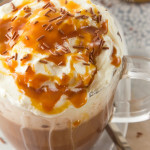 I’m confused at what you use for your salted caramel sauce? Do you make it yourself? 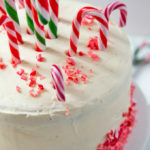 Sweet and salty is my absolute favorite dessert! 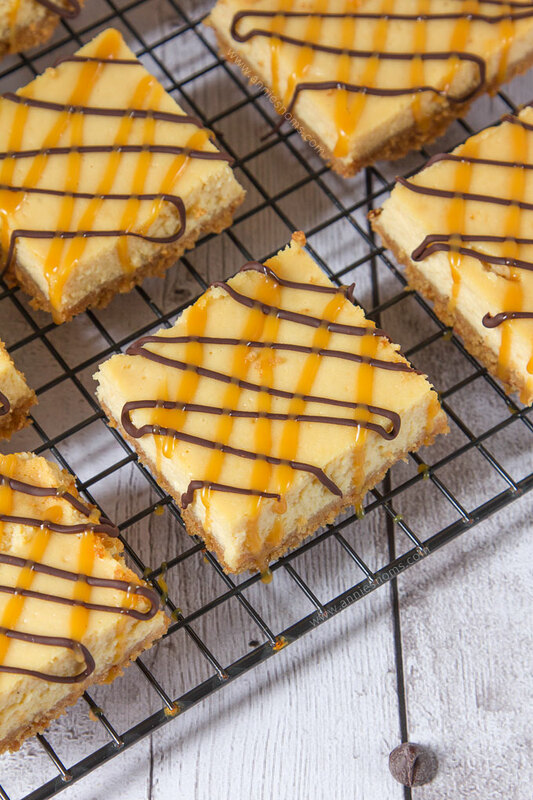 And these cheesecake bars look amazing!! 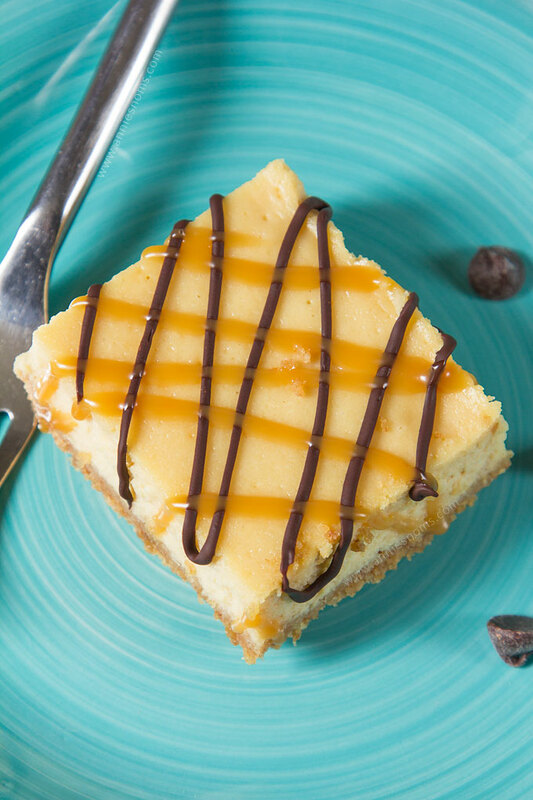 Your Salted Caramel Cheesecake Bars look fantastic! Thanks so much for sharing your post with Full Plate Thursday. Hope you are having a great day and come back soon!